This project was created on 05/03/2018 and last updated 14 days ago. I wanted to make a quadruped or biped with enough power to jump off the ground. Typical servo solutions were not good enough. 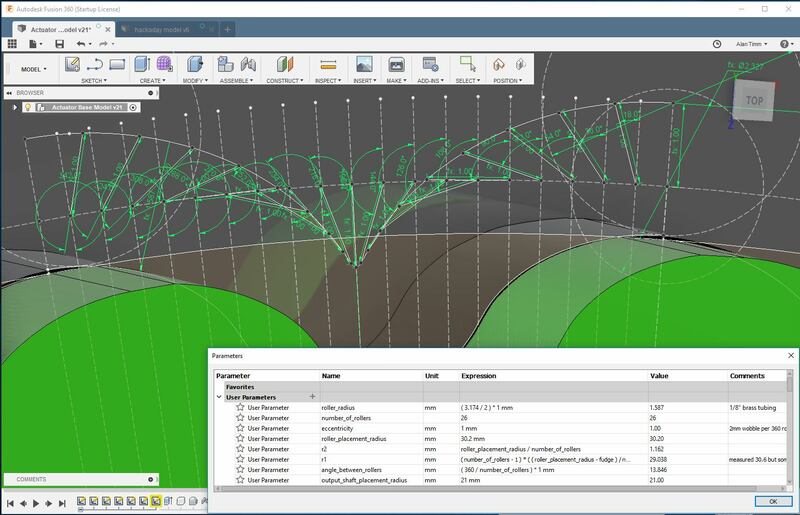 Software - Field Oriented Control (FOC) for position control. Mosfet Driver, Encoder and CAN communications. 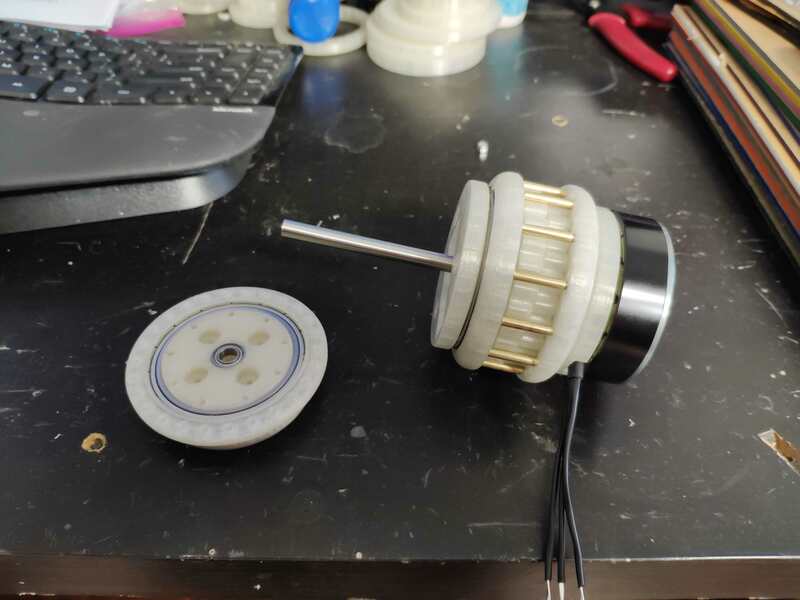 The purpose of the Actuator is to create a design than I can easily make with a 3D printer using cheap and powerful Brushless motors from China. I have three prototype sizes of Cycloidal gearboxes 44mm, 60mm and 78mm diameter. The size of the motor, number of poles and their shafts are also adjustable. The Cypress PSOC4 Controllers are not very common in the maker community. As I would like more makers to be able to use/modify/improve this Actuator, I am designing an Arduino version. It will be based around the MKR Zero with the SAM D21. Earlier I got the Centered Aligned PWM working for controlling the MOSFETs for driving the Brushless motor. Next was the SPI for reading the Magnetic Absolute encoders for the motor and joint positions. The SPI on the SAMD21 only has a single buffer which is not time efficient for this application. It does have a DMA on the SPI which is much more complex but the most efficient for operation. The problem is that it is not a standard feature for the Arduino system. I started with the following information. It also support Interrupts "dma_callback" to tell when the transfer has completed. Visual Studio and C# in .Net was used to write a simple test program. An X,Y foot position is generated, converted to hip and knee angles using Inverse Kinematics and sent to the serial to CAN converter (spare PSOC actuator controller). These packets are addressed to the two robot actuators to move to the required position. A second mode just returns Joint positions. I have modified the base robot actuator to make it into a full robot leg for a quadruped. It has a parallel linkage with springs and 2 robot Actuators. This means that the spring direction changes from rotation to almost vertically linear when the leg is in the standard walking positions. Different strength springs can be swapped for testing, with the aim to store energy at the end of a jump cycle and use it for the next jump. It will also be used for efficient walking/running. Everything rotates around the same joint, for the centre joint, described from top to bottom of the drawing. The rectangular extrusion is the same size as the quad&apos;s "backbone" and the robot&apos;s hip joins with the following design. The robots hip has three mounting points to the rectangular extrusion. The PSOC4 and the IDE Creator helps you to write code for the Arm processor, the CAN peripheral and the FPGA logic. When you use it for standard operations, then you rarely need to go deep into the component datasheets to make the design work as required. The examples are quite useful. But, if you want to design something that is not normal, then it is hard to find the information required. Each Actuator needs to have it&apos;s own individual address or CAN IDs. In my robot there will be at least 12 actuator controllers that will be CAN slaves, with one controller configured as a CAN master. This requires setting the CAN Receiver Mailbox ID via software. It is normally done in the .cysch CAN configuration page. There is a easy for setting the Transmit message ID. There was no such sub-routine for the setting the RX message ID. So after a lot of reverse engineering and some trial and error, the following code is used. Set different IDs for each actuator. This only works for Message Mailbox 0 and is good for my current needs. A second mailbox maybe required in the future that will be a broadcast message so all the receiver message Mailbox IDs will be the same. This could be used for an Emergency stop message. Send one message and all the actuators stop. If the RTR in the Configure &apos;CAN&apos; is enabled, the CAN transmitter will re-transmit the current packet until the received sends an Acknowledge packet back. As each Actuator needs to have it&apos;s own individual ID, this value and some others needed to be stored in flash memory. But when the PSOC4 software is updated it erases ALL of the standard FLASH. It also does not have EEPROM. It has an emulated EEPROM but again this is erased after updating the program. The PSOC4 I&apos;m using has user FLASH but there is no information on how to use it. To Read from FLASH, I set up a RAM array the same size as a FLASH row. To Write to FLASH, I set up a RAM array the same size as a FLASH row. In an effort to make the controller accessible to more makers I&apos;ve strated designing an Arduino based system. It uses the SAM D21 G 32-bit micro-controller as used on the MKRZERO board. This chip has an advanced Timer Counter Controller which can generate three centre aligned PWM signals. After sorting out the correct pin mapping it is up and running. The code is based on information provided in the Arduino forum by MartinL. Next up dual SPI. One for the absolute magnetic encoder sensors and the other for the FET gate Driver IC. PID and FOC should be easily ported across. Voltage and current measurement may be difficult because the Arduino doesn&apos;t support free running sequential ADCs very well. The SAM D21 does not have CAN commucations so it will need RS485 and USB. Do all the joints need the same size actuators? Are different reduction ratios required? Higher torque less speed. Needs a head, tail, electronics and batteries. Two leg has been 3D printed. Some assembly required. See end of YouTube video. It&apos;s the little one on the left. I have made some 2 axis legs for testing. They have enough torque but the speed is huge, even under load. Jumping is not impossible. Joint 1 is tail "wag"
The tail is used for the quadruped&apos;s balance. Based on previous testing, it should be able to lift 0.5kg at the end effector. Hi Paul, do you use the current for force/impedance control or do you use some extra sensing? Hi, Can you tell me where you got the extended axle shafts? and motor mounts? motor shafts are silver steel rob from https://mcjing.com.au/categorybrowser.aspx?categoryid=201 then cut to length and file a flat spot for the grub screw. The motor mount is the one that comes with the motor, it has just been attacked with a hacksaw. https://hackaday.io/project/157812-3d-printed-robot-actuator/log/146045-motor-modification I have just got some of these http://gogo-rc.com/store/index.php?route=product/product&product_id=3493&search=5010 which will not need the mount to be modified. Thanks a lot Paul. Appreciate the links. My shafts have grooves in them for the circlips. I was wondering if you found shafts that had the groove in them already. I guess I could use collars or something on straight shafts. Hi Perry, I have not found any off-the-shelf shafts that would suit what I need. You could make a groove with a saw or go to your local maker space and find someone with a lathe to make one for you. Thanks again Paul. I have a lathe so I think I will have a go at it. Hi Paul, I&apos;d like to say that your contribution is remarkable - thank you! I&apos;ve picked your actuator, among all others I&apos;ve ever found, to test in my mobile robotic arm http://autom.world :) Fingers crossed for the Arduino version you work on! I have just finished an anti-backlash version of this gearbox which I will upload in a few days time. I am still working on the Arduino version. I&apos;m having trouble getting the SPI with DMAs working on the mkrzero. Maybe now I&apos;m on holidays I will have some time to work it out. What sort of torque and speed are you aiming for on your joints? Anti-backlash version, that&apos;s great Paul! I don&apos;t have experience with DMA, but I had some issues with mkrzero in the past - with interfacing IMU mpu-9250. Ported the code to both Nodemcu v3 and STM32 (blue pill) and worked without any issues. Maybe that will help you too. For the robot a 300kg/cm (30Nm) torque would be ideal, but for proof-of-concept 10Nm in sufficient. For speed 20-30RPM is enough. Hi Jarek, I have finally got the SPI with DMAs working. Next is the ADC with DMA and RS485. I will then make a board. What voltage and current would your motors work at? Clapping and fingers crosses! I have exactly the same motors as you. Hi, just a quick question on the PCB design (specifically for the encoder). The schematic says "NF" which I know that not-fitted, but does this mean that you don&apos;t use any resistors at all? or what are the values for the resistor? I&apos;m trying to make them in bulks and have PCB companies to assembly the board for me as well. Also are the sizes for capacitors and resistors? Hi! Saw your latest Youtube (subscribed) and I&apos;m interested in using a version of your actuator design in the next Sixi robot. Our worst case at the base has a 20Nm holding torque. Can you advise us how to proceed, please? We&apos;d love to collaborate. Also we&apos;re interested in making a version that mimicks ulna rotation between wrist and elbow - so the input and output mounting brackets are coaxial to the rotation. Have you spent any time on that, and if so what are your thoughts? The actuator is very rigid because it has both top and bottom housings and output shafts. I&apos;m not sure how to make it rigid for ulna joints, I&apos;ll think about it. What angle of rotation do you need? Hi Dan. Yes, we can collaborate. My suggested starting point is with the CAD. I&apos;m using Autodesk Inventor. I think that you are using Fusion360. What format would you like the CAD in? Can you use the "pack and go" files that I have already uploaded? I’d love to have a parametric way to make the gearbox I need, then follow your wiring recipe. In your experience, will this generator work for among the printable profiles? Is your package already parametric? Sorry I’m not up to speed yet. 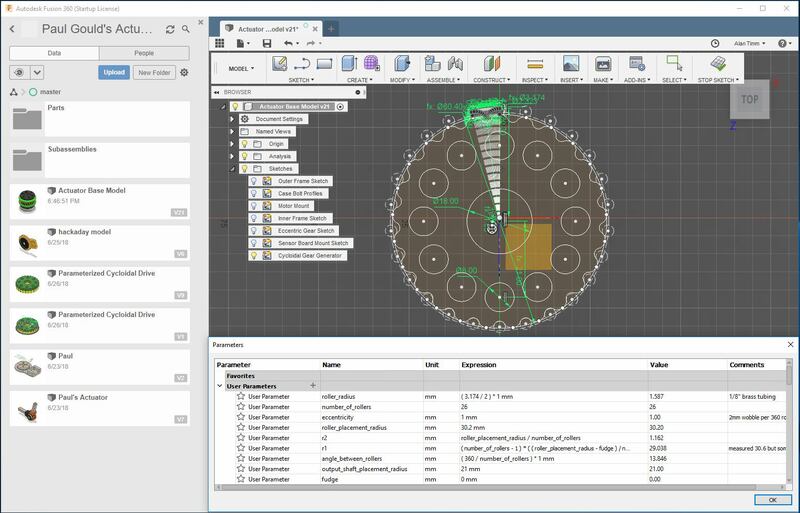 I haven&apos;t used Fusion 360 but the script from the reddit should be useful. I have created a parametric in inventor. I doesn&apos;t port well. What motor/controller did you have in mind? Hi, Himanshu here from Youtube.. So, I have been thinking of this 4 legged robot and have observed that it is much better if the robot has a low Unsprung Mass. Unsprung mass is: wheels and Suspension. Hence instead of attaching the lower leg directly to the motor.. a Pulley would be connected. this pulley belt will be going above the motor, present above the Hip joint motor. and belt will be having tension using a spring return system like in 3D printer Extruder. This definitely increases complexity and difficulty in designing and simulating but.. MIT Cheetah 3 is based on this design improvement. and the current Hub motor design is followed by ETH Zurich. I don&apos;t know what Spot Mini does but they do it better, so if you find their method then do that. Hi agenthimzz, I would like to have as little unspring mass as possible. It was a trade-off between total weight/complexity and unspring mass. The actuators were designed to be integrated into the joint and were made as compact as possible. I found that if I used 3D printed parts as "Fixed-Fixed Beam Moment" instead of the normal "Fixed-Free Beam Moment" they were much better. There were also designed to be linked together in various combinations to form robot arms or humanoid robots. This design also meant that I could test my parallel linked series elastic actuator set-up. Been following this project for a while, its huge for open source robotics! Thanks AVR. I&apos;m hoping that making the actuator work with Arduino will make it useful for more makers. I think that a combination of this and the "gear down for what" gearbox will make for a perfect system. Beyond the challenge of it, why did you create a custom controller vs the oDrive? Do you see any issues with oDrive and your actuator design for mere mortals like me who would go that route? I large part of it was to see if I could make it my own way. Mainly using Voltage FOC with a saddle lookup table on a CPU with no floating point. ( ~10 lines of FOC C code). I wanted full control over the actuator with room to grow as I learn more. The PSOC4 is my favorite uC/SOC, plus it has a little FPGA and easy CAN comms. I can connect any type of encoder up to it for motor and joint control. I didn&apos;t like the calibration set-up of oDrive (you have to reference every power-up). Using Voltage FOC motor control and dual magnetic encoders, I can tell where the motor and the joint is at any time. I am currently adding Series Elastic to the actuator. The FETs I use are very low R-on. The board also fit&apos;s my space requirement and I can make them with a simple soldering iron. oDrive are a great idea (I&apos;ve never used one) and they will add more features over time. There is a large community following and they are currently working on absolute encoders, CAN comms, a smaller single axis board and more control schemes. The oDrive CPU is very powerful and has room to do some much more. YOu can modify the code to suit your needs. The PSOC4 is not an easy CPU/SOC system to learn. Half the work is done in the CPU and half in the FPGA section. Debugging errors can be a pain. I started looking at porting the design over to a SAM D21 (Arduino Zero) but I didn&apos;t like the SPI. I will work more on this in the future as having an Arduino brushless actuator controller will make the project more accessible to more makers. Great work! I like the compactness of the gearbox system. Didn&apos;t have much luck with this concept. Direct drive is a bit too power hungry. Modern brushless servos can do pretty incredible things for a lot less money. Hi lion, this design is not for everyone. It&apos;s not direct drive, the cycloidal gearbox is 25:1 reduction. The cost is about $150 (the time is huge). The aim is 20Nm (200kg-cm), with speed of 0.05sec/60deg (testing required). The backlash is extremely low and it also backdriveable. I created this because I couldn&apos;t find a servo that suited me, if you know some good servos please let me know. I have an updated design. The bolts helped, but the actuator still binds when the assembly is compressed axially. This new version includes aluminum spacers. Switch back to version 50 for a better view. I built a prototype of the base design. Clearances look good, I&apos;ll print out a new prototype when the spacer parts come in with PETG. It looks like you&apos;re planning on using these at 12v. Would it be reasonable to assume that it should approach 20Nm of force at 24v? I&apos;ve been looking at your spring compliance setup. I don&apos;t see a 3rd sensor for spring deflection. I think... that if you&apos;re measuring shaft count / position and joint position after the spring you should be able to derive force and imitate compliance. I have an idea or two on how to integrate that into the actuator. And after futzing about a bit with the stm32f103, and then moving to the stm32f302 after realizing that the 103 makes you choose between CAN and USB, it dawned on me that there is no point. The PSOC 4 is a good fit for this application and seems to work well. 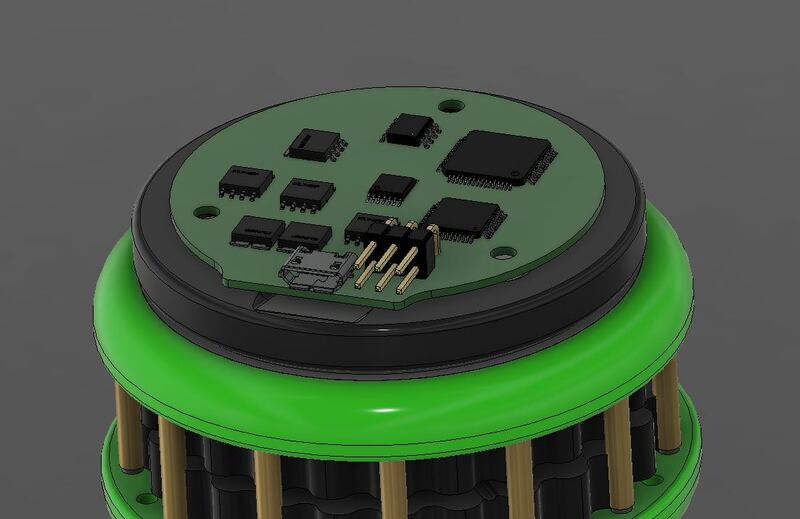 PCB design isn&apos;t my strong suit, but I&apos;m working to convert your design to a circular board integrating an AS5147 in the center, and using one of your carrier boards underneath for the motor shaft. This minimizes the SPI cable length, and puts the electronics right on the actuator. Speaking of which, where are you guys finding the AS5147/AS5047? Mouser and Digikey are out. Your actuator looks good. Go to Discord->Odrive->robotics. Others are making this actuator in metal. I plan on running this on 8S (32V) MOSFETs are rated at 40V. I&apos;m hoping for 20Nm with the 5010 motor. I&apos;m looking at the 6215 Brushless 170KV. I have just made a jumping stand for one leg. I haven&apos;t added the spring feedback sensor yet. I am trying to work out how to store the spring energy. I purchased a few AS5147 for testing last year. I am trying to find more but nothing yet. I thought the 5010 was spec&apos;d out at 6S 24v max? Maybe temperature dissapation is the limiting factor. In that case 32v sounds like fun. I&apos;ve been using KiCad. I grabbed Altium Viewer to get a closer look at your board. Electronics is a weak spot for me, but I can follow most of the datasheets and documentation. I&apos;m using your Cypress codebase to learn PSOC creator. Here&apos;s a sketch of what I have in mind. A circular board with an AS5147 mounted dead center, keeping the electronics close. No long SPI runs, just power and CAN to each actuator. motor shaft AS4187 mounted on a carrier board underneath. USBUART for pre-install configuration. The 5008 is 6S max and the 5010 is 8S max but it is rated at continuous operation with a lot of air flow. The PSOC code needs to be tidied up, sorry. The round board looks good. I&apos;ve been using the AS5047 boards from massmind.org. However, they only sell assembled boards and not the ICs themselves, so I don&apos;t know if that&apos;s any use to you. Yeah, looks like both the AS5047 and AS5147 are out of stock in the usual places. Per Paul, the AS5601 isn&apos;t suitable. There&apos;s also a MA700GQ-P that support SPI, but would require a carrier board change and most likely some code changes as well. Paul says that this one might work. Great design! Do you have an estimate of the torque-to-weight ratio? I&apos;m working on a similar project (https://hackaday.io/project/159404-opentorque-actuator) that puts out 56 Nm of torque and weighs 1.2 kg. I&apos;m curious how that compares to the specs of your actuator. The actuator weights 536g with all the electronics and cables. (Not including battery). Testing - (As in the video) Lifted 3Kg at 330mm = 10Nm (Voltage and Amps need to be rechecked). I like those large high pole count motors. I wanted to use them but I would have to change my control scheme and not use the magnetic encoder (only works well at 7 pole pairs). I just read that you are using the AS5047 magentic encoder with O-Drive. How well does it handle 0RPM holding positions? The AS5047 has been working perfectly so far. No issues with holding positions at 0 RPM. Currently I&apos;m just using the incremental ABI interface, but I&apos;m going to set up the absolute position interface so it doesn&apos;t have to search for the index pulse on startup. I see you&apos;re using the AS5147. How come you say it&apos;s limited to working with 7 pole pairs? That sensor has a resolution of 2048 CPR according to AMS&apos; website, which should be plenty for any high-pole-count motor. In regards to the efficiency of your gearbox, have you measured it at 75% or is that just an estimate? 75% seems low for a single-stage cycloidal reducer. If you&apos;re having issues with sliding friction, I recommend printing the cycloid disks out of nylon. I used Taulman Alloy 910 for the gears in my design and they run very smoothly. Gabrael - The data sheet of the 5147 says the the UVW interface support 7 poles pairs, so I assumed that it should only be used with 7pole pair motors for all the interfaces. I might be wrong on this and will have to do more research. I would like to use the higher pole count motors with a lower KV and higher torque and lower gear reduction. Did you try any other motor? How long does the 9235-100KV take to spin up to full speed? What RPM are you getting? I haven&apos;t measured the efficiency yet, I would rather underestimate. I don&apos;t think I am having sliding friction problems, it is all rolling elements. I have some Nylon but I have to upgrade my printer so that it can reach a higher temperature. The 7 pole pair limitation only affects the UVW interface, since it outputs commutation signals for each of the motor phases. Since you&apos;re doing the commutation from the microcontroller, you can use any number of pole pairs you want. The max RPM should be 2400 (24 volts * 100 rpm/volt). I haven&apos;t confirmed this though. These 9235 motors are great, by the way. They have so much torque you could use them in a quadruped with no gear reduction at all. Your design is impresive! It got me to thinking about how animals and insects can jump so well. In biological systems that are "jumpers" (fleas, grasshoppers, kangaroos, even humans), the tendons are loaded before a jump, and then the "release" happens ... which basically adds a spring into the system. There are linear wound springs (like in a dog walking leash - but stronger!) that might be usable in your system. You would have to "pre-wind" the spring, and then trigger it. Given a strong enough spring, you could get some pretty decent "instant" burst of power from a "small" addition. You mention backlash; if you have rotational transducers, couldn&apos;t you just "fix" that with software? That might introduce too much delay, maybe. Best of luck, and keep posting! Between you and Mike&apos;s Robot Dog (see: https://hackaday.io/project/52956-mikes-robot-dog/discussion-108871), y&apos;all are making me want to get a 3D printer, or learn to cast brass, etc! I am working on creating a video of the parallel linked series elastic actuator that is on the big quad. I am trying to work out how to store the spring&apos;s energy on foot fall/ landing and release it later in the gait. The backlash is quite small, it is the main reason I chose the Cycloidal gearbox design. It is more than good enough for e quad, maybe not for a robotic arm. I was after speed and torque rather than precision. - If you separate the eccentric lobes you can pin them separately during assembly. I&apos;m pretty sure that having a single pin driving both lobes is going to be the weakest point at load. I&apos;m also looking at 2mm v 3mm retaining pins. - I&apos;ve reduced the drive rollers from 8 to 6, and included 6 through hole bolts. The locknuts need to be trapped into the motor bracket earlier in the assembly. This should make the actuator much stronger. I&apos;m on the fence between having 6 drive rollers and 6 bolts, or going 4 and 4. I hacked together a parametric cycloidal gear box generator into Fusion 360, changing ratios is almost automatic by adjusting the parameters. I&apos;ve been going back and forth between a 26:1 and 32:1 gear reduction for the Gartt 5010. Out of curiousity, what design software are you using? On the electronics side, I have even more catching up to do. How are things going on your next controller? Depending on how invested you are in your SAM D21 design, the stm32f103c8 may be another option. It&apos;s what&apos;s used in the "STM32 blue pill" board. They&apos;re cheap, fairly well supported, and include CAN as well as a bunch of other features. Hi Alan, Adding the bolts is a good improvement. Just be careful you still have enough material at that diameter so that it doesn&apos;t weaken the gear. I tried to replace the 3mm rods with M3 bolts with a long shank. I had some problems getting the alignment correct. (It also took along time to take the unit apart). I have just created a parametric cycloidal gear in Autodesk Inventor (All my CAD is done in this program, I have it on my laptop for my day job). I got the SAM D21 up to the point where I don&apos;t like the CPU. The SPI only has a single buffer TX and RX and requires the DMA to use it properly/efficiently. I wanted to create an easy solution (Arduino) for brushless actuator control. I&apos;m not sure if I can hide the DMA in an Arduino library. I have thought about using the STM32F3 family but the PSOC4 is just so good. The problem is that is too complex for most makers. I have some STM32Fx development boards so I will see what i can up and running. The stm32f103c8 will still require the use on DMAs for the SPI unless I change the structure of the code/interrupts. Hi! In your video you showed it pulling 10 Nm @ 12 V with a peek of 5 amps. This is with the Multistar elite 5008 & a 26:1 gear ratio, right? I love the results, but am a bit confused. The 5008 is 330 Kv, which would be a Kt roughly 0.029 (Nm/A). Which is way under 10 Nm. Is there something I&apos;m missing? Hi MattB, Your maths is right. I have never done the Kt calc befre. Where did I go wrong? The arm is ~330mm between the centre of the 3kg weight and the pivot point. The battery is 3 cell Lipo ~12V. The cheap current sensor from Hobby King max value shows ~5Amps. I would guess that the filtering / averaging / update rate of the current sensor is not showing the actual peak. Is it the measurement Amps RMS? I wonder what the efficiency of the cycloidal gearbox is. I would be surprised if it was over 80%. Hobbyking claim that the KV is 330. I should be able to check this. Does the KV change as the speed approaches 0RPM/stall? Does the Saddled Sine wave output of the controller give a different reading than a normal sine wave. Could this effect the Kv and Kt values? As the arm moves from Vertically down to horizontal the torque required will increase. Maybe it is better to use a large pulley with a weight as this torque will be constant. I will set-up the test again with better equipment and post the results. It would be nice if the theory matches the actual. Hey Paul, this is an outstanding project, and congratulations on your win! For the parts that require you to center them, it would be a snap to design and print a centering spacer to use during assembly. I&apos;ve been eyeballing the failure modes, and I think the first part to fail at load will be the eccentric bearing lobes. That&apos;s based on the stresses between the top and bottom lobe and a single eccentric bearing pin, which I assume is going through the center of the top lobe. Maybe sticking a second pin through the center of the lower lobe would help mitigate that? And, did I see that you can backdrive the actuator? I wouldn&apos;t have expected that. I have to admit that I&apos;ve watched this video about 12 times already to understand how you&apos;ve accomplished this. I&apos;m looking forward to building a couple of these to see how they work. Aliexpress would be a great source for most of the parts like the bearings, bulk 2mm x 28mm steel dowel pins, and 3mm (2.6mm internal) brass tubing. the 2mm pins are a bit smaller (15%) than the 3/32". Do you think those will work? Otherwise there are other sources for true 3/32" x 1 1/8" steel dowel pins. Can you share a bit about the modified axle/shaft? Did you fabricate it? Or is that something that can be found and ordered online? Hi Alan, I tried to put a second pin in the eccentric top lode but the "order of assembly" did not allow it to happen (unless I press fit the motor on the main shaft after assembly, this was not going to happen). I get silver steel rods from minitech and the brass tubes from the local hobby shop. I always buy local if I can get the right part (no matter what the cost) and only order overseas if I have too. i prefer to make parts from scratch if I can. Hacksawing a rod and filing the ends are easy to do. Can the actuators be backdriven? I suppose if you want it to stand passively, you would not want that, bu it seems like putting the bearing in, on at least the interior pins, could greatly reduce internal friction. Since your external pins touch two of the cycloid rings at once, would bearings not help there? Your cad odel appears to have bushings over the exterior pins, but i feel like they might have the same issue. Backdriveable actuators are especially nice when you want to do force control, or try to map motor current to torque, which might be useful when trying to make this robot walk or jump. The Actuator is backdriveable. It is only a 26:1 ratio. I think that having it backdriveable with regenerative capabilities is a must for overall efficiency. I had a prototype with bearings on the outside pins but the reduction ratio was lower because of the bearing spacing around the circumference. Also that is a lot of additional bearings, which increases cost and weight. Series Elastic actuator is also much better for efficiency (the big quad design has this). I am also trying to work out how to store potential energy from the elastic actuator (spring). Store the energy on a foot fall and release when going to jump/step. I saw a project recently that used an atmospheric pressure sensor (very small) wrapped in a rubber material. When the rubber touched a flat surface the pressure on the sensor was registered. Made for a really quick contact sensor for feet. Might be useful for your quad walker. That is a nice idea but it will only tell you after you have hit the ground. It would be nice to know just before then so that you can turn off the motors so the joints are a bit "softer". The sensor deforms make contact before the leg reaches all the way down and transfers its full weight. It is like the pads and hairs on the bottom of a cat&apos;s feet can provide feedback for the cat to walk quietly. Or your keyboard keys making contact before it reaches full stroke. Maybe just to re-state one point. I had the idea that a motor controller should live INSIDE a length of the 25x25 tube. I saw that 25x25 tube and though "use it as conduit", "use it as housing for electronics", "use it as a heat sink", "EMI shielding if you ground it." "I wonder of batteries will fit inside?" Robots like these and to fall and take bubbles down stairs or worse the limbs get into self-collisions and rip wires from each other. At least until the motional planner is fully debugged. I know first hand that LiPo battery fires can&apos;t be put out, you just have to wait. I think a good way to design a motor driver is to look at what controls the driver. I think anyone building a walking robot is going to be using ROS/MoveIt or ROS/TOWR so you&apos;d want to run ROS Serial and a joint controller node on the driver. It would save a ton of work to build the controller on a CPU platform that can run ROS Serial. Not looking upward at the higher level controller might mean you later have to introduce a layer between. A chain of controller adapter PCBs is ugly. STM makes the STSPIN32F0 with builtin MOSFET drivers the chip is designed for robotics and BLDC motors. The higher level controller likely a "Joint Trajectory Action Controller" attempt to place joints in space at a given time and velocity within the limits of the hardware. This is the controller this driver will need to interface with. best to make it seamless. All that said. I&apos;m pretty sure I&apos;ll be using a stepper motor at fist. Steppers are easy to control. > I think anyone building a walking robot is going to be using ROS/MoveIt or ROS/TOWR so you&apos;d want to run ROS Serial and a joint controller node on the driver. If you look at the walking robot projects (https://hackaday.io/list/29475-walkers), you will notice that very few of them use ROS in any way. But they also lack any interesting behavior other than walking. What&apos;s the point of that? I would think the reason you use legs rather then wheels is because wheels can&apos;t work for you application. But so many of these robot have no application. As a minimum, I&apos;d want antonymous navigation and route planning that gets from point A to point B without attempting to walk through solid objects, replannrng aroubd obstacles. Some of them have pretty interesting behaviors. Also, lack of application is not an exclusive feature of ROS-less robots. For "antonymous" navigation you need sensors that cost two orders of magnitude more than the whole budgets of those projects. But they usually do obstacle avoidance, so they don&apos;t walk into things. No software is often better than crappy and bloated software. At least you get to learn how it actually is done. Albertson.chris - can you tell me about the joint controller have you have made? The PSOC4 controller can be configured to support the following communication protocols PWM, I2C, SPI, UART, RS485, USB, CAN, Step/Dir and LIN. I like CAN the best, as the packet handling is supported in hardware and it has a higher immunity to noisy environments. The CPU is running at 90% idle, so i&apos;m sure adding some sort of Trajectory planning should be possible. The current big quad I&apos;m designing requires interaction between the joints as the two actuators are joined as one parallel linked series elastic actuators. Two controllers, two gearboxes and one series elastic actuator. This will most likely require a centralized controller. The CPU in the STSPIN32F0 is not a "high end" controller. 4KB of RAM is not much for a Robot controller. I think a robot controller for a robot that has as many degrees of freedom is a quadruped is going to be hierarchical. Every group of 6 MOSFETS controls one motor has one CPU. The cPU only has to run a position and velocity feedback loop and monitor temperature. I would bolt the mosfets to the 25x25 mm tube as a heat sink. These controllers could live inside the structurel tubes and all connect to a bus and DC power. 4K is easy enough to run a couple loops and control one motor if not get a bigger uP. The next layer of control like does coordinated movement. It receives as input a series of vectors. The vector has a target position and velocity for every joint and also a time tag for when those positions are to be realized. It then sends commends to all the motor controllers to update their set points such that every point gets to it&apos;s target at the same time. Above that is the SLAM and navigation. The robot needs to know where it is and how to get to where it needs to be and hw to rout arub fixed and moving obstacles. This means a LIDAR, Vision, IMU, Kalman filters and so on. This is where ROS is best used. One person could never write a modern SLAM and sensor integration suite in one lifetime. The level above is what decides the where it needs to be part which is likely based on a high-level command give by the owner of the robot who just said "go downstairs and fetch me a beer"
Using the "fetch me a beer" scenario is a great place holder. It the design can do that is is general enough. I don&apos;t need a beer fetcher but I do want a personal assistant for a blind person. A machine that cn read signs and not bump into walls and communicate by voice. You are about to report the project "3D Printed Robot Actuator", please tell us the reason.